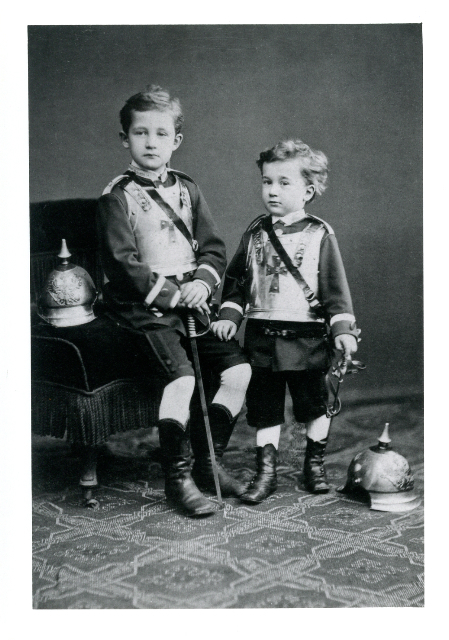 My grandfather Rudolf Höber loved his older brother Eduard dearly. While Rudolf was a scientist, Eduard (1871-1906) was a humanist and man of letters. He received his D.Phil. in comparative literature , and his dissertation on the German romantic poet Joseph von Eichendorff was published when Eduard was just 23. He made a career as a literary critic writing for the Berliner Tageblatt, one of the largest newspapers not just in Berlin but in all of Germany. While still a young man, Eduard was admired for his wit, intelligence and literary judgment, as well for the generous spirit that characterized his critical writing. In his mid-30’s, Eduard fell in love with Helene Schwarz, a rising poet in the Berlin literary scene. He was deeply devoted to her, admiring her talent and sense. They were a good looking couple, well-suited to one another, and married on July 1, 1906. Eduard had another passion besides literature, however: mountaineering. He had considerable experience climbing in the Alps, but this risky activity concerned his his new wife, who feared for his safety. When they married, Helene asked Eduard to give up climbing. Out of affection for her he agreed to do so — after one last climb. 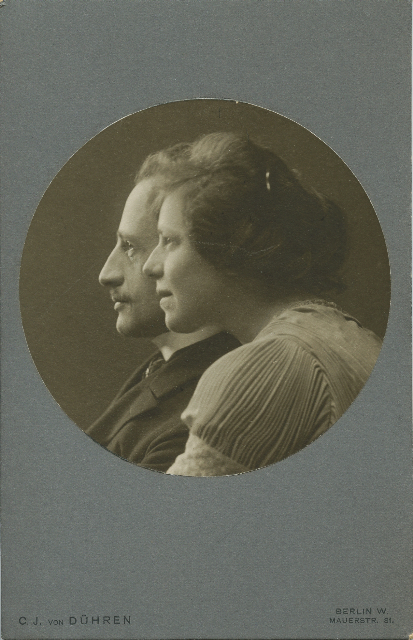 Two months after their marriage, Eduard and Helene travelled to Italy on their honeymoon. 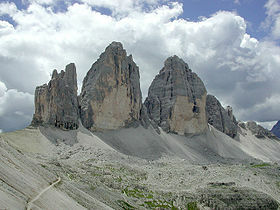 Their trip included the rugged peaks of the Dolomite s in northeastern Italy, not far from the Austrian border. There, on the morning of September 3, 1906, Eduard embarked on his promised last climb. Leaving Helene behind, he joined a climbing party to tackle the daunting Tre Cime (in German, Drei Zinnen). In the middle of the climb, Eduard’s rope broke and he fell to his death. The Drei Zinnen, where Eduard was killed. Eduard’s funeral in Berlin was attended by a large mass of people, including artists, writers and most of Berlin’s substantial press corps. Helene was devastated, crushed by her profound loss. A book of her poems published a year later is filled with verses of longing for her lost husband. She did not remarry until years later. My grandfather, Rudolf, never forgot the lost brother he loved so much. 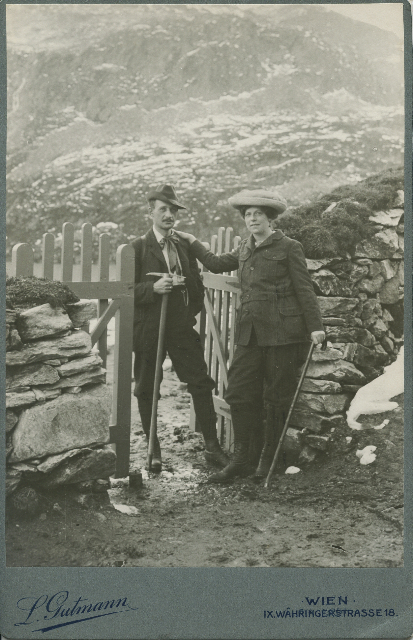 Eduard Höber and Helene Schwarz Höber in the mountains. “The issue in this election … is the people against special privilege.” — President Truman’s 1948 speech written by a German refugee. Less than ten years after his arrival in America, Johannes Hoeber became a speech writer for the President of the United States. 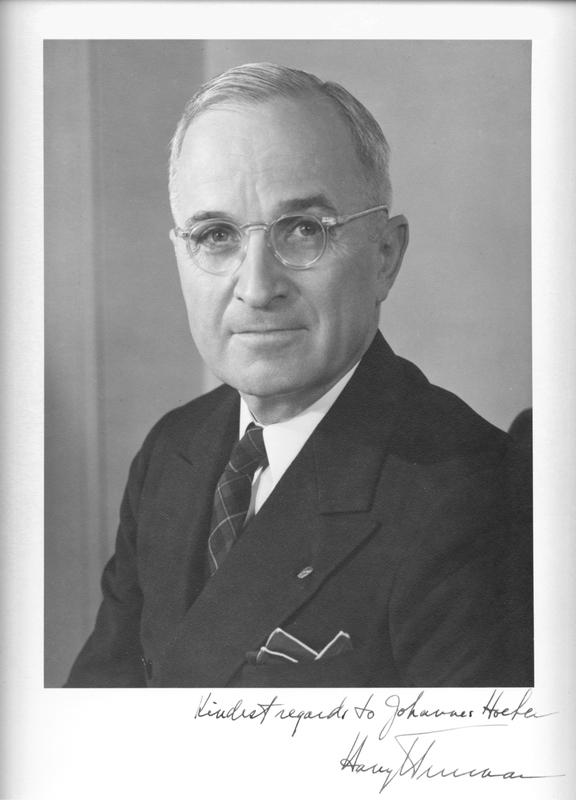 In the brutal 1948 presidential election campaign, incumbent Harry Truman was the underdog. A small group of researchers and speech writers helped him achieve his unlikely victory. When the death of Franklin Delano Roosevelt made Truman president in 1945, the Republican old guard launched a concerted attack on the social welfare achievements of Roosevelt’s New Deal. Programs for the poor, the elderly, children, farmers, all were slashed by the Republican dominated 80th Congress. President Truman fought back hard. Though Truman lacked Roosevelt’s charisma, he had a sharp understanding of the needs of American working people and a plain-spoken manner that mass audiences could understand. He launched a hard-hitting but fact-based campaign for reelection directed at the understanding and common sense of the American electorate. They rewarded his respect for their intelligence with a solid majority of votes in the November election. To help President Truman articulate his message, the White House created a small research and writing staff headed by former liberal Pennsylvania congressional candidate William L. Batt, Jr. Bill Batt selected five more people for the Research Division, as it came to be called, including his Philadelphia friend, Johannes Hoeber. Johannes had gotten out of Nazi Germany in late 1938, but was fluent in English and versed in social democratic political principles. Within weeks of his arrival he was enmeshed in a political reform effort in Philadelphia, and by 1943 was writing campaign speeches for the liberal Democratic candidate for mayor, William Christian Bullitt. In 1947, Johannes became a founding member of the Americans for Democratic Action (ADA) and president of its Philadelphia chapter. For many years, the ADA provided national leadership in the struggles for civil rights, education, health care and services for the poor. Bill Batt met Johannes through the ADA, and sought out his research abilities and writing skill for Truman’s 1948 campaign. The Research Division office was in a hot, noisy building near DuPont circle in Washington and its members were housed in a cheap, seedy hotel nearby. This was before air conditioning, and Washington’s heat and humidity in July and August were formidable. Nevertheless, the Research Division cranked out speech after speech, sending dozens of speech outlines as well as complete scripts to the White House for final editing by the President’s personal staff. 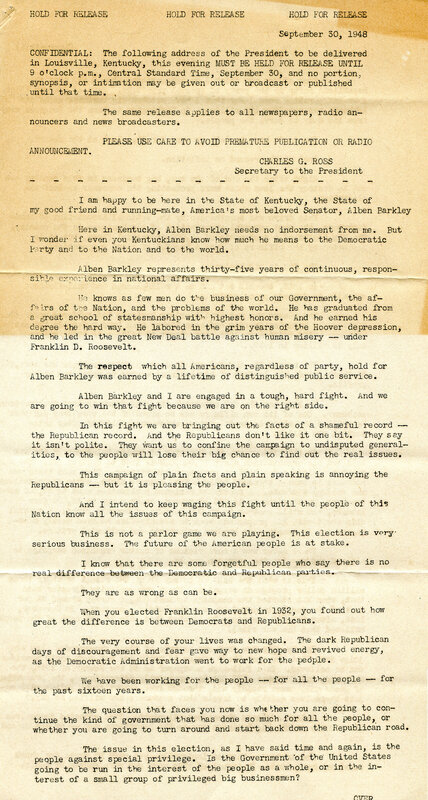 In late September, on short notice, Truman’s campaign staff added a stop for a major speech in Louisville, Kentucky. No one else being available, Johannes wrote most of the speech himself, working through the weekend to get it done for the White House to review. Johannes’ files include a note from the Research Division secretary saying how pleased his colleagues in the Division were that the President delivered the speech with few changes from Johannes’ draft. You can read the full speech here. The Truman Presidential Library interviewed Johannes in 1966 about his work for the Research Division; you can read that interview here. 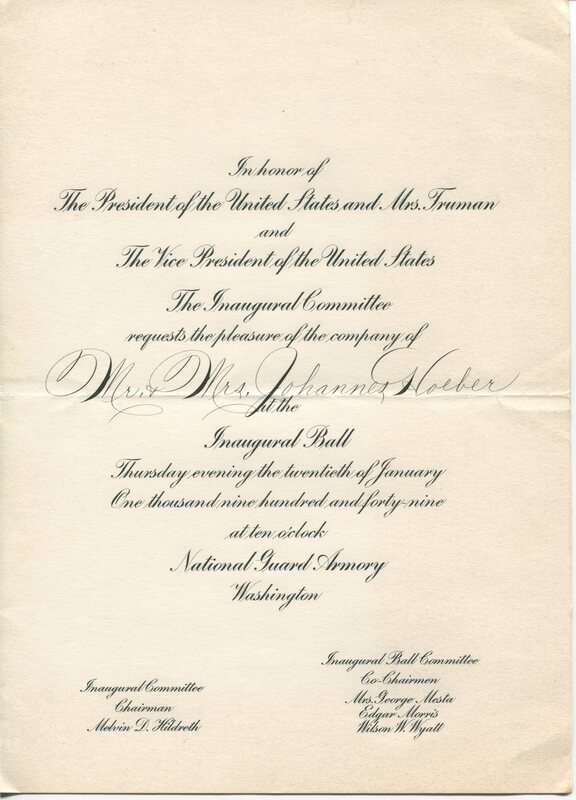 After President Truman’s reelection, Johannes and Elfriede were invited to the Presidential Inaugural Ball on January 20, 1949. Their income, however, was far too modest to allow for the purchase of the obligatory ball gown, so Elfriede made her own . She stitched a floor-length skirt of black velvet and a low-cut brightly colored top of remaindered upholstery fabric, and with it wore an antique cameo with pearls she inherited from Johannes’ mother. Years later Elfriede recalled proudly that the materials for her Presidential ball gown cost her less than ten dollars.